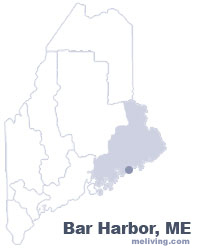 Bar Harbor, Maine is located on the east side of Mt. Desert Island and surrounded by Acadia National Park. Bar Harbor and Acadia National Park welcome thousands of visitors annually. Acadia National Park in Bar Harbor is one of America’s most popular national parks. The park is most busy during the summer and fall months. Mira Monte's mission is to provide relaxation and comfort in beautiful, quiet surroundings of an elegant bed and breakfast inn. It's your vacation and you get to make the choices that meet your needs. Our friendly staff is always there for you. Indoors and out, the Bar Harbor / Acadia region of coastal Maine has entertainment you can enjoy. Explore the granite cliffs, hiking trails, and beaches of Acadia National Park, just minutes for this Bar Harbor, ME hotel. Visit the picturesque Bass Harbor Head Lighthouse, tee off at the beautiful Kebo Valley Golf Club of take an exciting rock climbing course at the Atlantic Climbing School. Offering stuffing views of the ocean and mountains, Hampton Inn Bar Harbor is set in a private, secluded location just a short walk from downtown Bar Harbor. This seasonal hotel is open to guests from May 1st to October 31st each year. There are a variety of fabulous hotels, and historic inns and B&B’s to stay at in the area. Bar Harbor is only a short distance to other famous attractions such as Campobello Island, President Franklin Roosevelt’s summer home, the Schoodic Peninsula, and nature-based attractions. The town of Bar Harbor was first settled by Israel Higgens and John Thomas in the 1760’s which they named the town Eden after the area’s great beauty. The name Bar Harbor came from Bar Island’s and it’s great sand bars. To share any Bar Harbor, Maine information with us, please contact us. To share any Kittery, Maine information with us, please contact us. Learn more about advertising in MELiving.